Finding the perfect checking account that meets all your banking needs and one that adapts to your lifestyle can be a very difficult and time consuming decision with all the options out there to choose from these days. If you’re not careful your checking account can eat away at your savings without you even realizing it from hidden fees. Banks and other financial institutions spend big money on appealing television, online, and direct mail advertising to try and win over your business. However they usually never disclose the fees associated with their checking accounts. 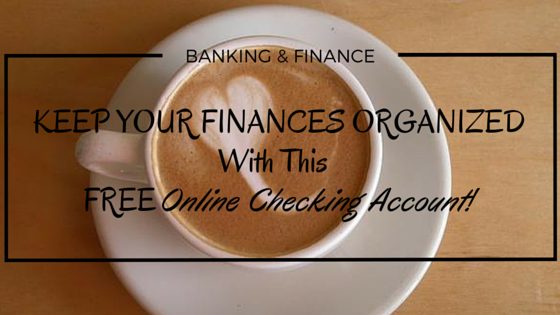 Today, I want to talk to you about an absolutely FREE online checking account and how to use it to save money, keep your finances organized, and track all your spending with it. I have multiple checking accounts and this is by far one of my favorites. Chances are you never heard of this bank because they do very minimal advertising, most of their business comes from references and word of mouth. This bank is ranked in the top 25 banks for their services, which makes it ironic how few people actually know about this great bank and the outstanding financial services they offer, such as their free checking accounting. Many checking accounts charge monthly maintenance fees, fees to deposit checks, statement fees, ATM fees, debit card fees, and other fees. Most people think they have to pay these ridiculous checking account fees and may not realize that overtime these fees really add up. If your bank currently charges you any of these fees associated with your checking account, you should considered another bank or financial institution. In the paragraphs that follow, I’ll explain how you can eliminated banking fees, manage your finances, track all your spending, and save money with this awesome and totally free checking account that comes fully loaded and conveniently adapts to your lifestyle! Who Offers This One-of-a-kind Checking Account? The name of this bank is BBVA Compass. Whether or not you ever heard of them, BBVA Compass is a leading banking franchise and ranked in the top 25 largest U.S. commercial banks based on market deposit share. They have truly amazing customer service and make it their mission to find financial solutions for every customer. I’m going to talk about their ClearChoice Free Checking Account, but I also love their Certificate of Deposit (CD) for the competitive rates they offer. It’s 100% Free! Enough said. Open & Manage Your Account Anywhere, Whenever. Besides this checking account being 100% free! It also has many other great benefits and features I admire. One being that it’s an online checking account, so you can open an account and manage your account anywhere, at anytime. It’s a National Bank. They’re a national banking franchise, so they have brick-and-mortar bank locations which are located across the nation. This is nice if you ever wanted to supplement your online banking with in-person banking. No Monthly Service or Maintenance Fees. This is a huge benefit! Most checking accounts offered by other banks will often charge you some type of service or maintenance fee. BBVA Compass’s ClearChoice Free Checking will never charge you a monthly service or maintenance fee! No ATM Fees. You will never be charged a fee to use one of BBVA Compass’s ATM’s to access your money! Mobile Banking and Online Banking. This is a must for anyone who wants to be able to do ALL their banking from anywhere, anytime. You’ll have full-access to your account from anywhere with your mobile device or computer. You’ll be able to fully manage your account, transfer money, and monitor your spending anytime, 24/7. Personalize Your Debit Card. When you open your free checking account, you’ll receive a Visa debit card which you’re able personalize the way it looks and set up alerts associated to your card. You can add a photo of yourself on your debit card or other really cool pictures and photos you have! You can also create customized alerts for transactions made with your debit card, which makes it easy to monitor your spending and transactions. 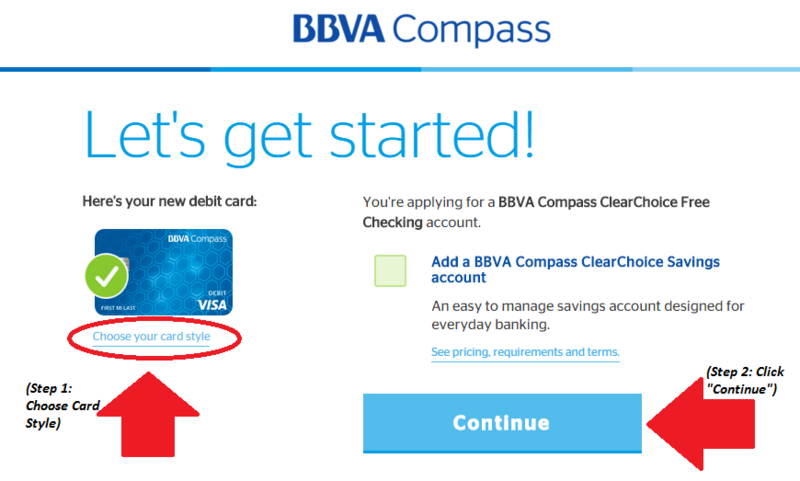 The first thing you have to do is go to the BBVA Compass ClearChoice Free Checking Account webpage by clicking here. After clicking on the link provided above. Apply online for your ClearChoice Free Checking Account, by clicking the “Apply Now” button. On this page you can choose the style of your debt card or go with the basic default card style option. Then click the “Continue” button. Fill in all the required information on the application. It’ll ask you to review and confirm your account information on this page. Once you’ve completed this, you’re done! 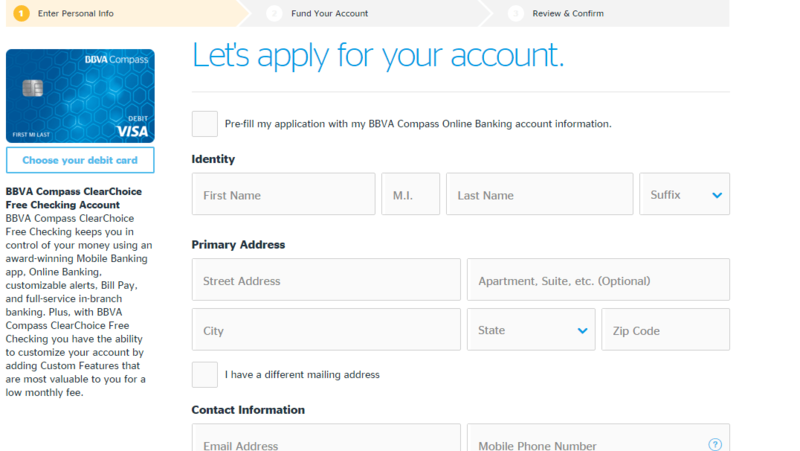 Learn how you can save money and eliminate banking fees with a BBVA Compass Free checking account!